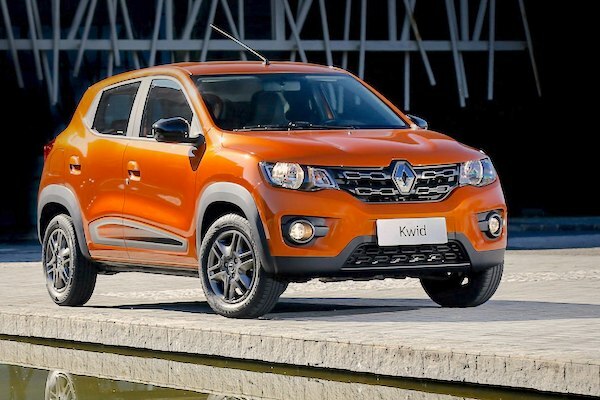 The Kwid helps Renault contain its fall to -31% in November. It’s getting worse and worse for new vehicle sales in Argentina: -44.9% in November at 39.565 registrations after October down 36.5%, September down 33.6%, August down 22.8%, July down 14.4% and June down 9.4%. Year-to-date volumes are now down 9.9% at 767.871 units. Renault (-31%) manages to lose significantly less ground than the market to snap the brands pole position for only the third time this year after January and August at 14.7% share, distancing Volkswagen (-51%) while Toyota (-26%) also posts a “reasonable” loss on the third step of the podium. It’s hell below, with Peugeot (-64%), Fiat (-58%), Ford (-56%), Citroen (-55%) and Chevrolet (-54%) all freefalling even faster than the market. Nissan (-31%), Mercedes (-33%) and Jeep (-34%) resist somewhat just below, with Dongfeng (+267%), Smart (+37%), Foton (+33%) and DS (+14%) posting rare gains but remaining at 0.2% share or less. Over in the models ranking, the Toyota Hilux (-36%) cements its YTD lead ahead of the Chevrolet Onix (-58%), Toyota Etios (-59%) and Chevrolet Prisma (-51%) while the new Fiat Cronos is down two spots on October to a still very commendable 5th place. The Renault Kwid (+88%) celebrates one year in market at #7, with the VW Polo (+152%) and Toyota Yaris (+491%) also showing great progress. Full November 2018 Top 50 All-brands and Top 240 All-models below.